Our rainbow trout contains heart-healthy Omega-3s, are a good source of lean protein and an excellent source of Vitamin D. Not only is rainbow trout a healthy choice, it’s also delicious and easy to prepare. Its mild, clean flavor and delicate texture pair well with a variety of seasonings, sauces and sides. Grilled, sautéed or baked, rainbow trout is the versatile, sustainable superfood. 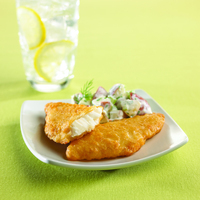 MRS. FRIDAY’S® TAVERN BATTERED® HADDOCK FILLETS 2-3 OZ. 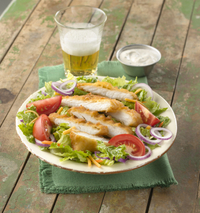 MRS. FRIDAY’S® TAVERN BATTERED® COD FILLETS 1-2 OZ. KPCU BEER BATTERED COD 2 OZ.